The Advertising Standards Authority has banned a "misleading" television advert by the international development charity Voluntary Service Overseas. In a ruling published today, the ASA said the advert falsely suggested that all donations would go towards healthcare and told the charity that its future advertising must not imply funds would be used in a specific field if this was not the case. The advert, broadcast in January, featured a voiceover about a volunteer called Natasha, who was described by on-screen text as a volunteer paediatrician who worked with sick children in west Africa. The advert asked viewers to give £2 a month to the charity’s Send a Volunteer Appeal "to send more volunteers like Natasha directly to where they’re needed most, to where they can save children’s lives". The advert said each volunteer sent overseas shared their skills with local doctors and nurses so they could save more lives. 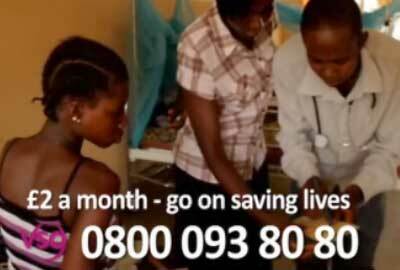 One viewer complained about the advert and said it implied that all VSO volunteers were doctors and all donations would be used to help save babies. In its response to the ASA, VSO said it was not its intention to mislead. It said it could show only one aspect of its work in the time it had in the advert. The charity said it had previously found that covering more than one area of its work meant that it was less successful in raising funds. It said it took care not to say that healthcare was the only area of its work and the advert referred to volunteers rather than doctors. The ASA found that some of the advert’s claims did imply that all VSO volunteers worked in healthcare and that donations from the appeal would be directed to helping sick babies. "While we considered the ad did not imply that all VSO volunteers were doctors, we considered, on balance, that it misleadingly suggested that all donations were used in the field of healthcare," the ruling says. According to the ruling, Clearcast, which approves TV advertising, said that adverts for aid organisations working in developing countries could never encompass all of the work the charities do. Paul Matthews, head of individual giving fundraising at VSO, said in a statement: "VSO volunteers do work in many other fields, such as improving education, promoting good governance and helping people to develop secure livelihoods so they can work their way out of poverty. "We need to raise funds to support all of this important work. The ASA’s adjudication asks us to reflect the breadth of that work in our fundraising and we’ll take those comments on board in future."